OAXACA CITY, Mexico — As it can be anywhere, life can be hard for some in Oaxaca. You see poverty here, in the street beggars. Urchins selling cheap crafts show a desperation sometimes. But there’s happiness, too, with the pleasures of good food, loving family and a beautiful place to live. A local program called En Via helps promote the well-being of women in Oaxaca Valley villages by providing microloans to help them start and maintain their own businesses, from weaving workshops to small tiendas or farm plots where they grow garlic or raise a pig or a few goats, spreading the benefits throughout their families. Visitors to Oaxaca can help En Via’s efforts by taking a $50 half-day tour during which they get to meet and ask questions of loan recipients. In turn, proceeds from the tours go for more loans. A face can tell a lot about a place. Here are a few of my favorites from a tour with En Via. I’ll tell more about the program and these people in a future Seattle Times story. Antonina Varela Andres smiles proudly behind the counter of her tienda in Abasolo. 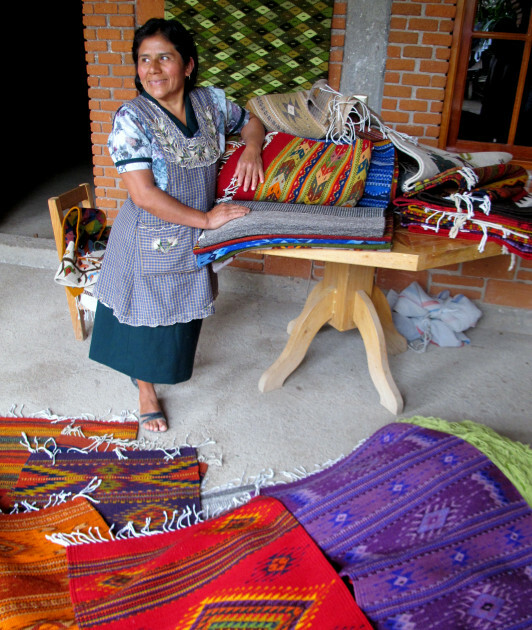 Yolanda Sosa Gutierrez is another Teotitlan weaver who has benefited from the En Via microloan program. Anastasia Soriana Martinez is adding pig farming to her list of talents after growing garlic and raising chickens with help from En Via.